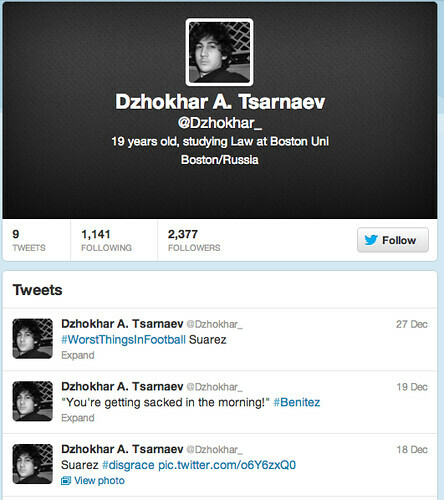 Dzhokhar Tsarnaev's secret Twitter account is fake. This is the Twitter profile page of @Dzhokhar_, who happens to share a name and a now-widely-shared profile photo with the Boston bombing suspect who is still at large. 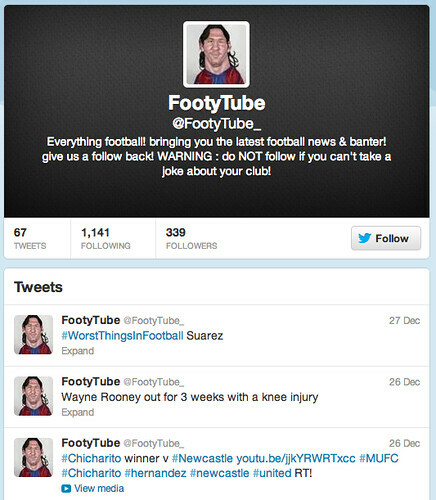 Until today, it was the Twitter account for @FootyTube_. The user just changed his pic, handle, and bio, and started deleting some of the tweets. But up to the moment he switched, he was following the exact same number of people and his last tweet was identical. Fake social media accounts are a plague of any breaking news event now, but this one took a little more than the usual effort—this owner of an unpopular feed realized that old tweets would give the fraud a whiff of realism. Maybe, like a rival fake tweeter, he’d get a false rumor repeated on the police scanner. So, congratulations! You’re an incredible jackass introducing obviously false information into the world during a manhunt that’s already left one cop dead! UPDATE: Now Adrien Chen says that @J_Tsar is the Twitter account to watch. Chen knows whereof he speaks; if he’s right, the bomber was sending irreverent messages days after the bombing. But notice that the Twitter account 1) has existed for a while and 2) doesn’t feature an obviously ripped-from-news profile pic.